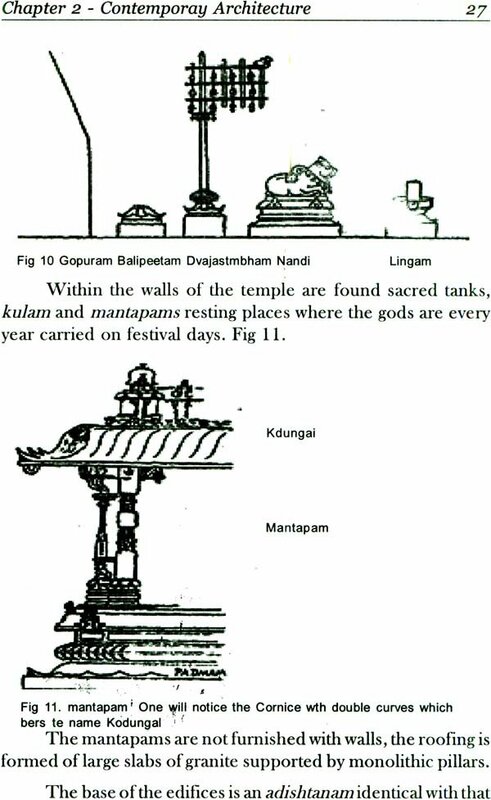 With a view to stimulate interest in one of the important areas of South Indian Archeology, precisely called Dravidian Architecture and direct that interest into fruitful fields of work, this little handbook has been published. This English version of the French work, is rather in the nature of an introduction to the subject. This introduction is intended to enable the systematic work being undertaken with success by those to whom a regular course of training is impossible. 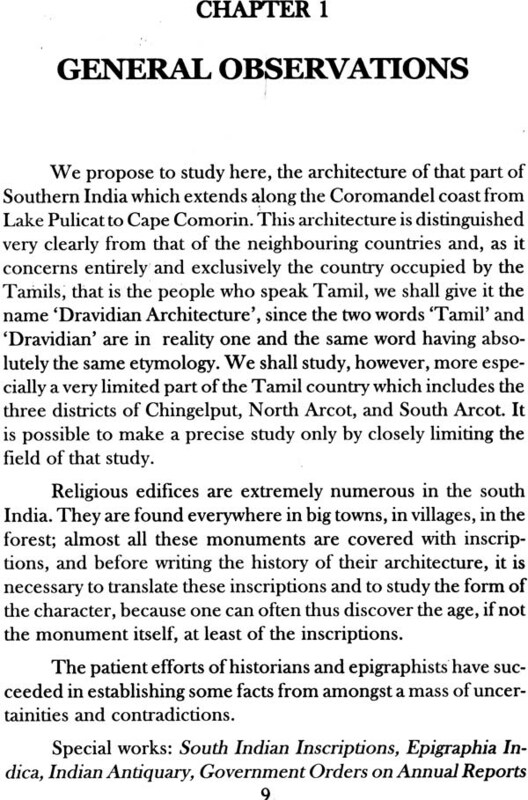 The Architecture of that part of Southern India which extends along the Coromandel Coast from Lake Pulicat to Cape Comorin, has been critically studied. 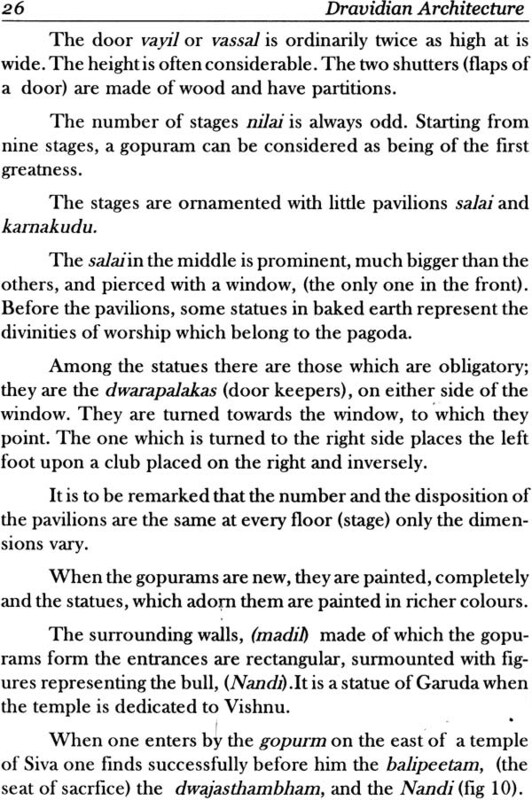 This Architecture is distinguished very clearly from that of the neighbouring countries and, as it concerns entirely and exclusively the country occupied by the Tamils, the name 'Dravidian Architecture', since the two words 'Tamil' and 'Dravidian' are in reality one and the same word having absolutely the same etymology. Replete with illustrations, this will book will be a handy guide to those who wish to understand the intricacies and growth of Dravidian Architecture. The institution of a chair of Indian History and Archaeology at the University of Madras gives evidence of the rising interest in these subjects not only at the University but also among the cultured Public. That this interest should be so directed as to make fruitful, few will deny. It is with a view to stimulate interest in one of the subjects comprises in the term Archaeology, and direct that interest into fruitful fields of work that this little handbook has been rendered into English and published in the present form. I made the acquaintance of the talented author of the French work, the Archaeology and Iconography of South India (Published by Paul- Geuthner of Paris in Annules Musee Guimet) through a review of the work in the Journal of Royal Asiatic Society by M R Sewell. In the course of growing acquaintance his suggestion that a handbook, such as the one here offered to the public would be useful, struck me as a very good one, and I readily took upon the responsibility of bringing out this English version of the French work. Which is rather of the nature of an introduction to the subject of his larger work than an abridgement of it. 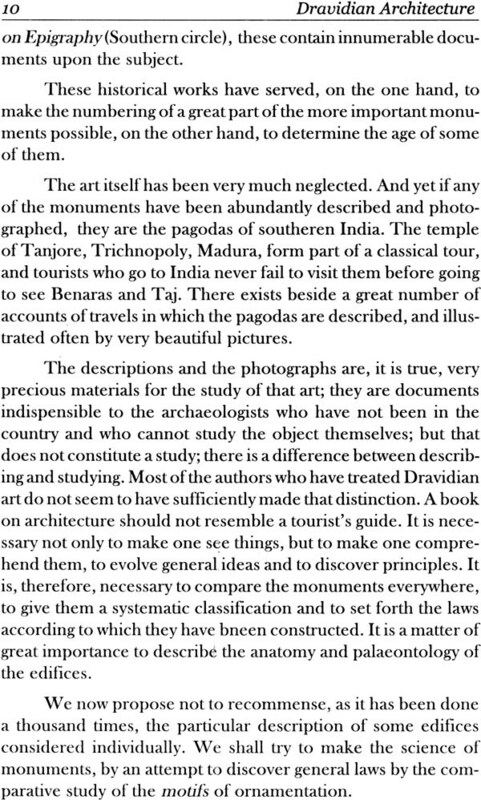 He has since brought out in English part I of his Pallava Antiquities, which gives ample evidence of what systematic work in subjects like this can achieve. This introduction is intended to enable the systematic work being undertaken with success by those to whom a regular course of training s impossible. The French text of the author was done into English for me by friend Mr.K Amrita Rau, M.A., Reader in Dravidian Philology, University of Madras to whom it gives me the greatest pleasure to acknowledge my obligations. The translation had the benefit of Prof. Jouveau Duberuil's own revision and as his approval in the form in which it appears. In case this should find welcome among those interested in these unremunerative, though far from unpleasing studies, I shall be happy to go further forward and provide introductory manuals in other allied subjects such as Epigraphy, Numismatic, etc. with the assistance of specialists in these various branches. I take this occasion to acknowledge my deep debt of obligation to Profesor Juveau-Duberuil for his disinterested labours for this little book, and place the book before the learned public in the hope that both he and is editor will have the greatest satisfaction of an appreciative reception which is the highest reward which labourers in such fields have at all a right to expect. It is hoped that University student will take kindly to this subject, so that when they pass out of the University into various walks of life, they may find in this, the opening for an enjoyable hobby, each according to his or her opportunities.